EAST LANSING, Mich. — Senior center Jenna Allen scored 16 points and freshman guard Nia Clouden added 15 to lift No. 17 Michigan State to a 77-60 victory over No. 9 Maryland on Thursday night. The Spartans (13-4, 3-3 Big Ten) led almost throughout, racing out to a 20-4 advantage in the first quarter. Maryland (15-2, 4-2) closed to within three at halftime, but Michigan State took control again in the third in this matchup between the highest-ranked Big Ten teams in this week’s AP Top 25. Overall, this is MSU’s second all-time win over Maryland, but the Spartans have captured two of the last three meetings. It was the second victory over a top-10 team for the Spartans this season. They beat No. 3 Oregon on Dec. 9. Overall, Michigan State has defeated four ranked teams this season, with all four victories coming at the Breslin Center. MSU is 4-1 against ranked squads with its only loss coming against then-No. 13 NC State, which is currently undefeated. Michigan State made five 3-pointers in the first quarter. The Spartans made only one after that, but they kept playing with confidence. Junior guard Taryn McCutcheon scored 12 points for Michigan State, which had lost three of its previous four games. Junior guard Shay Colley and sophomore forward Sidney Cooks both added 11 points as five Spartans reached double figures. Brianna Fraser led Maryland with 22 points, while Taylor Mikesell added 12 for the Terps. The Spartan offense was aggressive to start the game. Michigan State used a 9-0 and a 15-2 run in just over four minutes to take a 15-4 lead early in the first quarter. Allen came out swinging with seven points in the first five minutes of action. The run extended to 14-0 after a McCutcheon steal and a layup as MSU went up 20-4 with 3:28 left in the first period. A pair of Fraser free throws stopped the run and made the score 20-6. The 25 points allowed in the first half were the fifth-most this season for the Terps. In the third quarter, Maryland cut the lead to 40-37 before an old-fashioned three from Colley put MSU back up by six. After a pair of Colley free throws MSU re-took a double-digit lead 49-39 with 4:57 remaining. Michigan State out-scored Maryland 22-13 in the period. The Spartans play Sunday at Rutgers, which is the last remaining Big Ten team without a conference loss. • Thursday’s upset win over No. 9/9 Maryland was Michigan State’s fourth home win over a ranked team, marking the first time that the Spartans have defeated four ranked teams at home since 2004-05 when MSU defeated No. 18/17 Iowa, No. 11/12 Minnesota, No. RV/24 Purdue and No. 2/3 Ohio State. • The upset victory was MSU’s third home win over a ranked team, joining No. 3 Oregon (88-82 on Dec. 9), No. 16 Iowa (84-70 on Dec. 30) and No. 18 Minnesota (Jan. 9), marking the second time in last four seasons that the Spartans have beat four ranked teams in the same season . . . in 2015-16, the Spartans topped No. 16 Northwestern (home), No. 5 Ohio State (home) and No. 9 Ohio State (neutral). • The Spartans are now 4-1 this season against ranked opponents, improving to 23-15 overall at home vs. ranked foes under head coach Suzy Merchant. • Michigan State is now 10-0 this season at home this season and have a 13-game home winning streak dating back to last year. • Overall, it is the second-straight season and fourth in last six seasons that the Spartans have defeated three or more ranked teams in the same season . . . last year, MSU beat No. 22 South Florida (neutral), No. 11 Maryland (away) and No. 21 Michigan (home) . . . in 2015-16, the Spartans topped No. 16 Northwestern (home), No. 5 Ohio State (home) and No. 9 Ohio State (neutral). 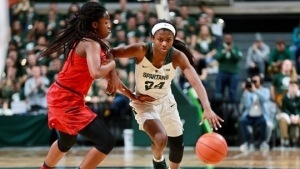 • Thursday was Michigan State’s first home win over Maryland in the all-time series, as the Spartans have now beaten the Terrapins in two of the last three meetings after last season’s 82-68 win in College Park. Previous ArticleUConn basketball: Megan Walker outscored the entire Tulane team. Here's how she did it.